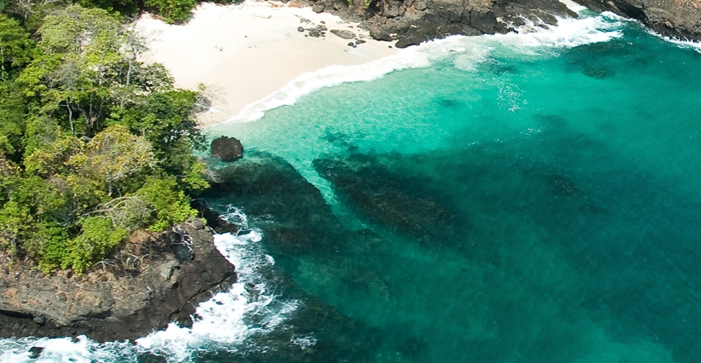 Located in the Golfo de Panama the archipelago de las Perlas, as the locals call the Islands, harbor a few of the most pristine and well-preserved beaches of Panama. The Islands are located not far away from Panama City and for many Panamanians a perfect getaway for the weekend. Back in the days it wasn’t cheap to travel to the islands since it was only possible by your own boat of plane, but nowadays the ferries take you to one of the Pearls for a reasonable price. The islands cover a large part of the Golf of Panama and are sheltered from the strong currents and harsh weather conditions of the Pacific Ocean. As the Pearl Islands are not undiscovered but mostly uninhabited the flora and fauna is probably the best attraction in and around the islands. Apart from the white sand deserted endless beaches and the dense jungles full of flowers and bird sounds the islands have much more to offer. The marine life around the Pearl Islands is so abundant that you probably have never seen anything like it. Since the Pearl Islands are in the Golf of Panama they are protected against the rough Pacific, which makes it a safe haven for marine life. When scuba diving or snorkeling you will encounter great schools of fish, turtles, dolphins and one of the highlights are the great Whales. Whale watching is therefore a must do when you visit the islands. In the dense jungles on the islands you will find dwarf ant eaters, owls, boa’s, deer’s, iguanas, crocodiles, Neques (small rodents), parrots in all different colors, Cocalecas (walking birds), wild boars, small reptiles and many more. Isla Contadora is the main island to start you trip to the Pearl Islands. This Island offers all the tourist facilities tourist want nowadays. You can find resorts, hotels, restaurants, bars and tour operators on the small island. Isla Saboga is less touristic and the local inhabitants of the islands live here. Isla Del Rey the island of the King and Isla San Jose are the best islands to visit unspoiled flora and fauna. The beaches here are magnificent and stolen out of a magazine, or visa versa?